Following on from his huge success and sell out run at the Edinburgh Fringe last year with THE BLANKS, American comedy star Sam Lloyd (Ted from TV’s Scrubs) is back at the fringe with one man comedy play Fully Committed. Written by Becky Mode, and by arrangement with Josef Weinberger Limited Lloyd returns to the Fringe to play all 37 roles in this machine gun paced, hilarious one-man comedy play. Lloyd plays struggling New York based actor Sam Peliczowski, with the worst restaurant job in the Big Apple, reservations clerk at a fancy Manhattan restaurant. Stuck in a basement cell he has no opportunity to meet the all-important agents/directors/casting people he wishes to that frequent the restaurant, nor any chance to meet women or men or to even get any tips. Sam is the protagonist of Fully Committed and Lloyd gets to play 36 other characters in this comic tour-de-force effortlessly switching between the restaurant’s narcissistic chef, snooty French Maître’d, customers including a Japanese tourist, Naomi Campbell’s assistant and thirty two more! Lloyd was awarded Best Solo Performance for the role at the StageSceneLA awards, who called it ‘A veritable comic tour-de-force’. 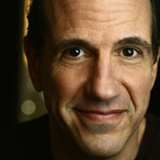 Sam Lloyd is probably best known for playing brow beaten lawyer Ted Buckland in nine seasons of TV’s Scrubs but has also been seen appearing in The West Wing, Desperate Housewives, Malcolm in the Middle and Seinfeld amongst his many TV and film credits.